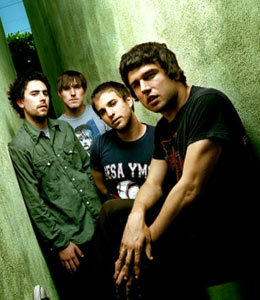 Say Anything Biography, Discography, Music News on 100 XR - The Net's #1 Rock Station!!! 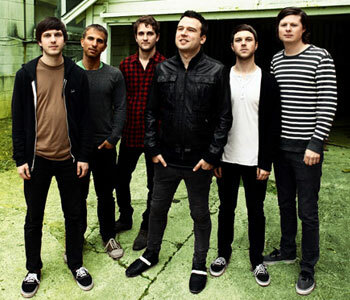 Hailing from Los Angeles, California USA, Say Anything started out as a one-man Punk-influenced Alternative-Rock band. Max Bemis wrote all the words and arranged most of the music on the group's first album. "...Is A Real Boy" originally came out on the Doghouse label in August 2004 and after its release, Say Anything hit the road sharing the stage with such notable acts as Dashboard Confessional, Saves The Day, The Bronx and Straylight Run, but over the next couple years Bemis looked like he might sabotage his career before it got started; a series of severe meltdowns, one of which ended with the gifted songwriter recklessly running into a busy Brooklyn street, landed the 22-year-old in a Texas psychiatric center. 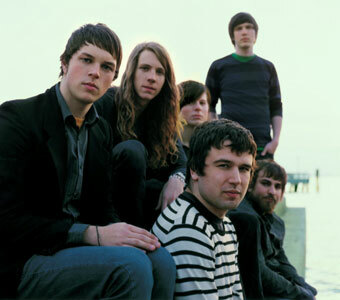 The shuffling line-up only stabilized in 2006 with Max Bemis on vocals, Jake Turner and Jeff Turner on guitars, Parker Case on keyboards, Alex Kent on bass and Coby Linder on drums; "...Is A Real Boy" was eventually re-issued by J Records in 2006 with a bonus second disc that included seven unreleased tracks. The album reached #8 on Billboard's Top Heatseekers chart producing the Hot Modern Rock top 30 hit, "Alive With The Glory Of Love". October 2007 saw Say Anything release an ambitious double-CD set called, "In Defense Of The Genre". The disc's first single "Baby Girl, I'm A Blur", which pulses with a synth beat and unwinds into a tangle of doodling riffs, fast-strummed guitars and layers of vocals, hit #29 on The Hot Modern Rock Tracks and helped send the album into the top 40 of The Billboard 200 list. The group followed that record up with the equally eclectic self-titled LP; released in November 2009, it peaked at #25 on The Billboard 200 while the main single, "Hate Everyone" faltered just outside the top 30 of The Alternative Songs chart. After the departure of Alex Kent, Say Anything announced the addition of bass player Adam Siska, formerly of the band The Academy Is... . In March 2012, the sextet released their fourth studio album, "Anarchy, My Dear", through Equal Vision Records. The disc includes two singles: the furious "Burn A Miracle" and "Say Anything".